The Gill Indoor Track team earned three medals in the NJISAA Prep B Championships, which were held at the Lawrenceville School this past weekend. 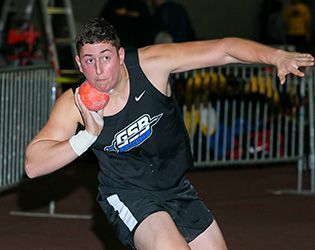 Junior shot put thrower C.J Licata, who has already posted wins in the Somerset County Championship, New Balance Games, Skyland Championship, and Randolph invitational, won the Prep B event with a throw of 57' 9". Senior Erica Phiansunthon followed up for the girls’ squad, winning the shot put event with a throw of 31' 7.5". Senior Matt Petit placed second overall in the boys’ 800 meter run with a time of 2:05.64. The team’s next big meet is on Saturday, February 18, in the NJSIAA State Group Meet at the Bennett Center in Toms River. Congratulations to our athletes. Go Knights!